In our fast-paced, ever-changing world, where it seems we can barely keep up with the rapid development of technology, Jacky Tsai, an artist whose work juxtaposes the old and new, past and present, east and west, quite aptly explores the theme of AI technology in his new lenticular print edition - Artificial Intelligence. Tsai’s successful contemporary art career has seen him create a number of works that play on opposing worlds, and in particular themes of eastern versus western culture - a reflection of his own Chinese heritage and his experience of coming to the UK as a young art student. His work has a distinctive pop-art style realised in his bold graphic designs, subjects borrowed from film, television and comic books, and use of vibrant stylized patterns. 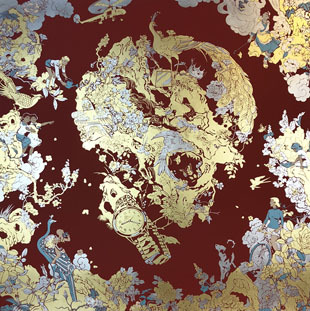 However, he also brings his own unique twist to the pop-art style, integrating traditional Chinese imagery, subjects and crafts. Tsai’s new lenticular print Artificial Intelligence pictures the robot C-3P0 - a well-loved character from the Star Wars franchise, setting his wits against a wise Chinese Master. 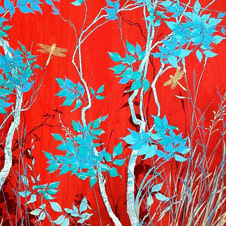 They are placed within a beautiful serene floral landscape with motifs typically seen on traditional Chinese ceramics. 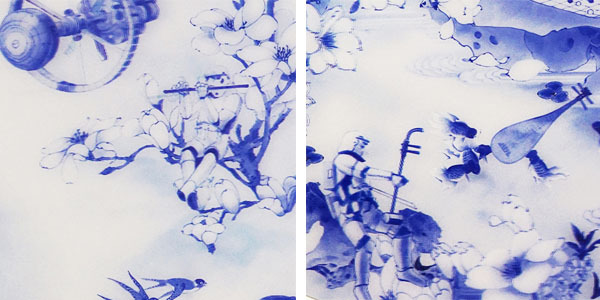 However, with a characteristic Jacky Tsai twist, the musicians in the background are humorously replaced by Star Wars Storm Troopers sitting amongst the trees and flowers, playing the Chinese harp, bamboo flute and Jinghu (a chinese bowed instrument traditionally seen in Beijing Opera). 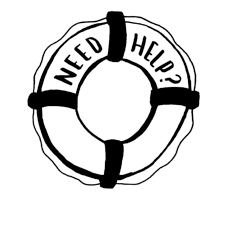 To see 3D MOVING IMAGE (10Mb file opens in new window), please click here. 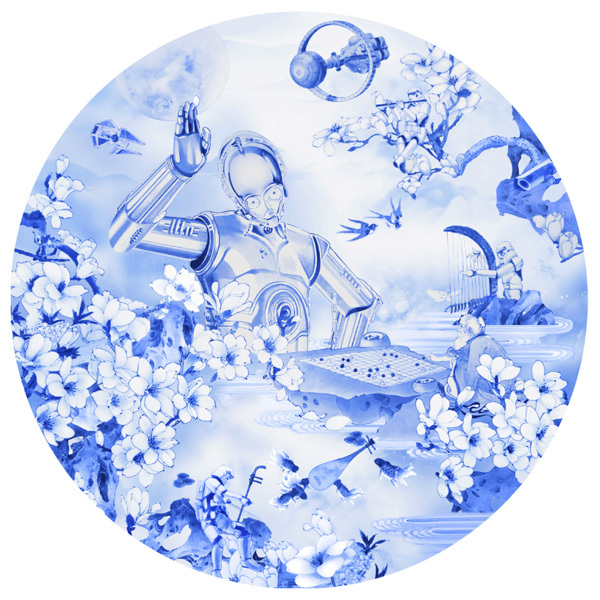 Tsai’s Artificial Intelligence was originally created as a work on porcelain, a further means for the artist to starkly contrast the contemporary imagery of Star Wars robots with that of traditional Chinese arts and crafts. The delicate material may have also been a reference to the fragility of the concept of artificial intelligence and the unreliability of technology. Through this work, Tsai is not only exploring the contrasts of the contemporary West with the traditional East, but also introduces the general theme of technology and artificial intelligence - encouraging us to engage with this often complicated topic through the use of accessible images and a witty approach to his art. 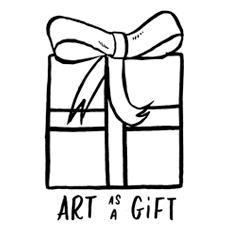 The somewhat controversial development of AI technology is one that is debated not just within the world of science, but also in art and philosophy because of the potential impacts (both positive and negative) on all human lives. The arguments around AI seem to center on the understanding of the significant advantages it can bring to us - solving challenging computer problems, helping build complex technology, or contributing to the medical sciences - versus the fear of the unknown. In this work, Tsai opens the discussion on AI in a witty and light-hearted way, using characters we are familiar with in popular culture as a bridge to understanding artificial intelligence in a positive light. Artificial Intelligence is today being released as a limited edition lenticular print - an extremely difficult medium which requires meticulous adjustments in the angles of the image to transform it from a two dimensional image to a three dimensional moving one. Tsai describes the lenticular medium as one that can draw the audience into the surreal world that the he is creating, with hypnotic effect. Certainly, when standing in front of this print, the three-dimensional movement brings the image alive as C-3P0 raises his hand to his head in thought as the Master makes his next move. The movement of this image adds to the light humour of the scene being played out, and opens up our imagination to the fantasy world that Jacky Tsai is creating. The robot and the man seem equally matched in this game of wits, and Tsai describes the characters as playing in harmony - representing his own belief that despite the debates around the development of AI technology, ‘Real-life Intelligence’ will eventually find a balance with artificial intelligence. 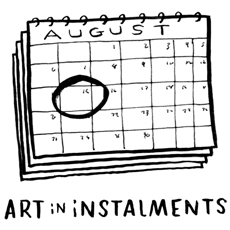 The lenticular print edition Artificial Intelligence is available at £6600.00 and further information can be found here. Danish artist Henrik Simonsen is well known for his abstract and colourful work of the natural elements. Often inspired by childhood memories, sketches done over several years and from travelling around the world, Simonsen creates intriguing landscapes which fascinates collectors all over the world. This week we visited Simonsen in his studio in Kreuzberg, the very creative part of the former East Berlin and today known as a hotspot for artists. 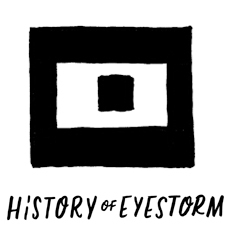 On a warm and partly sunny summer day our conversation covered Simonsen’s passion for his art, life philosophies and the importance of having a long perspective. 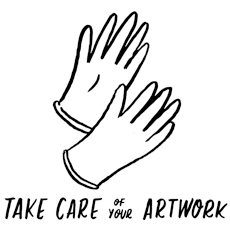 Across twenty-five limited editions of individual designs that our gallery have launched since 2012, almost 1000 hand-printed works have been created with the artist in a five year period. From these prints, approximately 800 have found homes in both public and private collections. 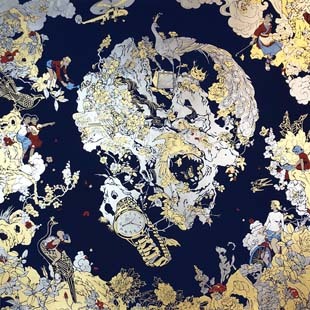 It has been a decade since Chinese-born artist Jacky Tsai made his name internationally with his infamous ‘Floral Skull’ designed for Alexander McQueen.